A.M. Ran with Tyler, Daniel, and Jeff. Tyler and Daniel ran the first 4 with us then turned around. Jeff and I ran 10.1. Did 2 fat miles - first in 5:55, second in 5:57. Total time was 1:15:45. P.M. 1.5 with Julia in 13:51, 2 with Benjamin and Jenny in 17:57, last mile in 7:57. A.M. Ran with Daniel and Jeff. After the warm-up Jeff joined me for a portion of The Interval Tempo, while Daniel went on at an easy pace. I was still tired from the chess tournament on Saturday, so I adjusted the target pace accordingly. The plan was to warm up in 5:45, then 5:30 in the next mile, then hard in the last. Overall the tempo went better than I expected, but not quite according to plan. Jeff went only 2 miles to be cautious as his calfs were feeling tight. First 0.5 was 2:55, then Jeff pushed it and we hit the mile in 5:41 (84, 82 quarters). Then we ran the next mile in 5:23 (80.5, 80.5, 81,81). That was faster than planned, but it did not feel too bad. However, without Jeff I knew it would be hard to speed up or even maintain in the third mile. Third mile was difficult. 82,83,81,79 - 5:25, total time 5:25. In the first half HR was 162, then hit 166 in the third quarter, and all the way up to 169 in the last quarter. Slightly higher than normal at all paces, probably due to warmer weather. Cooled down with Jeff, got to 11.47 miles. Then we picked up Benjamin and ran 2 more miles in 15:28 with the last mile in 6:47. I ran that portion barefoot. Noticed that my HR was matching Jeff's when running barefoot. Normally mine is 15-20 bpm lower. Now I am remembering that Jack Daniels noticed the same things in his studies - barefoot economy is not very good. At least for runners with tender feet. In Five Fingers I hit normal HR for the pace. So my suspect is that when running barefoot you have to reduce friction forces until your feet get tough. And those friction forces are probably an important component of running economy. Again, for runners that are used to shoes. Long-time barefoot runners might not be relying on the friction as much. Another piece on info in the friction forces department. I noticed I have a very hard time running barefoot up a steep grade (going north under the 800 North bridge), and the problem is the friction becomes more than I can handle. Changing subjects, I found out that my performance in the chess tournament earned me a rating of 1288. Thanks to the emphasis on sports in the Russian culture there is a fairly decent way to compare performances in different sports. They have a system of rankings in each sport, including chess and running. So my chess performance is equivalent to about an 18 minute 5 K.
P.M. 2 barefoot with Jenny in 17:48. Julia ran the first 1.5 in 13:31. A.M. 10.1 with Jeff in 1:14:33. Did two fat miles, first in 5:55, second in 6:03. Noticed that our HR gap was decreased - his HR was only 9-10 bpm higher than mine. My HR was normal for the pace, though. Tried a new invention today. My new Five Fingers have been rubbing my heels. So I made myself Five Finger compatible socks by cutting out the front part. It worked quite well. P.M. Ran barefoot. 2 with Benjamin in 18:03, 2 with Jenny in 18:44, Julia ran 1.5 with us in 13:57. 0.33 with Joseph in 4:05. A.M. Ran with Jeff, Daniel, and Vern. Did a 4.7 warmup with everybody, then Jeff and I ran the 5 mile tempo. The plan was to run about 5:40-5:45 pace focusing on good form and good rhythm, and practice improving stability on the right foot. We ran the course in the normal direction starting from Geneva. Splits by mile: 5:46, 5:43, 5:41, 5:37, 5:26. Splits by half: 14:22, 13:51. HR: Around 150 in the first mile, around 154-155 in the second and third. 162 in the fourth. The last mile had the quarters of 83, 81, 81, and 81. HR made its way to 164 in the first half, and then all the way up to 170, and back down to 167 once I ran out of juice. Jeff dropped me with about 500 to go, and gapped me by 11(!) seconds while I was still running 5:24 pace. His last quarter was 71. Jeff's HR stayed around 8 bpm above mine most of the time. Yes, the pace was easy enough for him to be able to report it frequently. Interesting observation - right after the 180 turn we surged to get back up to pace. My HR stayed steady, while Jeff's spiked then dropped back down once the effort was back to normal. And it goes without saying that in comparison to me he felt a lot more comfortable. That sheds some light on a few things, assuming this is a pattern and not just one occurrence. If you push and HR does not respond, you will have oxygen debt, so you can only push that far. That would explain why I really really do not like mid-race surges, get knocked out by hills, sharp turns, etc. Total mileage for the run was 11. P.M. 2 with Benjamin in 18:03, 2 with Jenny in 18:44, Julia ran the first 1.5 with us in 13:51. A.M. Ran with Jeff. We did 12.06 in 1:29:27. Ran into Seth, he joined us for a little bit. 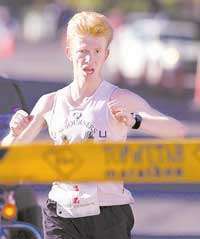 He is running the Utah Valley Marathon as well and was exploring the course. So it looks like it will be faster than Ogden. So far we have two Kenyans (William Tete and Ezekiel Ruto), Seth, Jeff McClellan, me, Kory, and Jeff Shadley. Did 2.5 in 14:38 for a sort of marathon dress rehearsal and practiced trading leads. Later took Benjamin to a track meet. He ran 6:04 in the 1500. It was windy, but still this shows we need to figure out what is going on. His splits were 1:30, 1:40, 1:39, last 300 in 1:15. So in essence he ran a good first lap and then was just stuck in 6:40 pace gear. He said he did not feel tired afterwards. That is not surprising since we do not run 6:00 pace in training very much. Maybe we should once a week or so, I do not want him to do it too much as he is still growing. He did win the Bantum division, although there were only two people in it. But he was competitive against older boys, all were in the same heat. P.M. 2 with Jenny in 18:07. Julia ran the first 1.5 in 14:12.